ESO astronomers, employing the GRAVITY instrument on their Very Large Telescope Interferometer (VLTI), have announced the first direct detection of an exoplanet via optical interferometry. "GRAVITY", an instrument on the European Southern Observatory's (ESO) Very Large Telescope Interferometer (VLTI) has made the first direct observation of an exoplanet using optical interferometry. 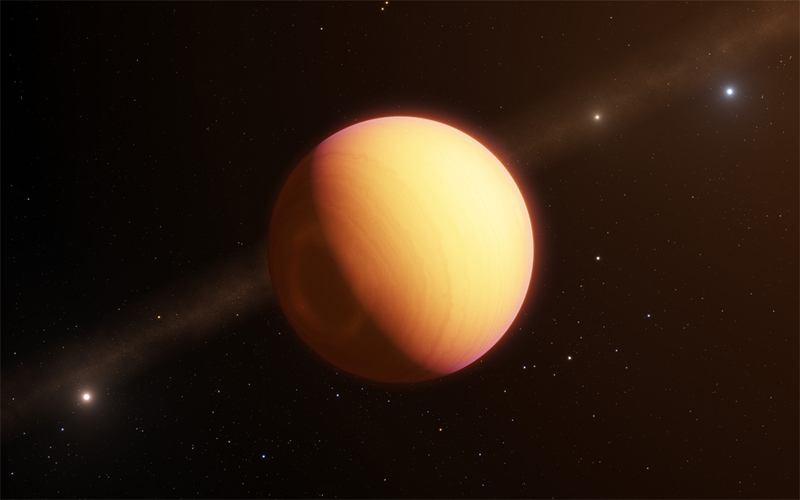 This method revealed a complex exoplanetary atmosphere. The technique, described in the peer-reviewed journal Astronomy and Astrophysics, presents unique possibilities for characterising many of the exoplanets known today. The exoplanet was discovered in 2010, orbiting the young star HR8799, which lies 129 light years from Earth in the constellation of Pegasus. Although it is classed as a main-sequence star, HR8799 belongs to a rare group known as Lambda Boötis, peculiar stars with a lack of metals in their upper atmospheres that combine properties of A and F-type stars. The planet in this study, HR8799e, is a 'super-Jupiter' – both more massive and much younger than any planet orbiting the Sun. At only 30 million years old, it is a baby in astronomical terms and young enough to give scientists a window into the early formation of planets and planetary systems. With a powerful greenhouse effect and leftover energy from its formation, HR8799e is a truly hellish place. Clouds of hot iron and silicate particles blanket the entire planet in a raging storm that exceeds 1000 °C (1832 °F), more than double the temperature of Venus. Revealing these characteristics of HR8799e required an instrument with very high resolution and sensitivity. GRAVITY can use ESO's four unit telescopes to work together and mimic a single larger telescope, using a technique known as interferometry. This creates a super-telescope – the VLTI – that collects and precisely disentangles the light from a planet's atmosphere and the light from its parent star. This was the first time that optical interferometry has been used to reveal the details of an exoplanet, and the new technique furnished a spectrum of unprecedented quality – 10 times more detailed than earlier observations. By using GRAVITY, the team's measurements were able to confirm the composition of HR8799e's atmosphere, which contained some surprises. 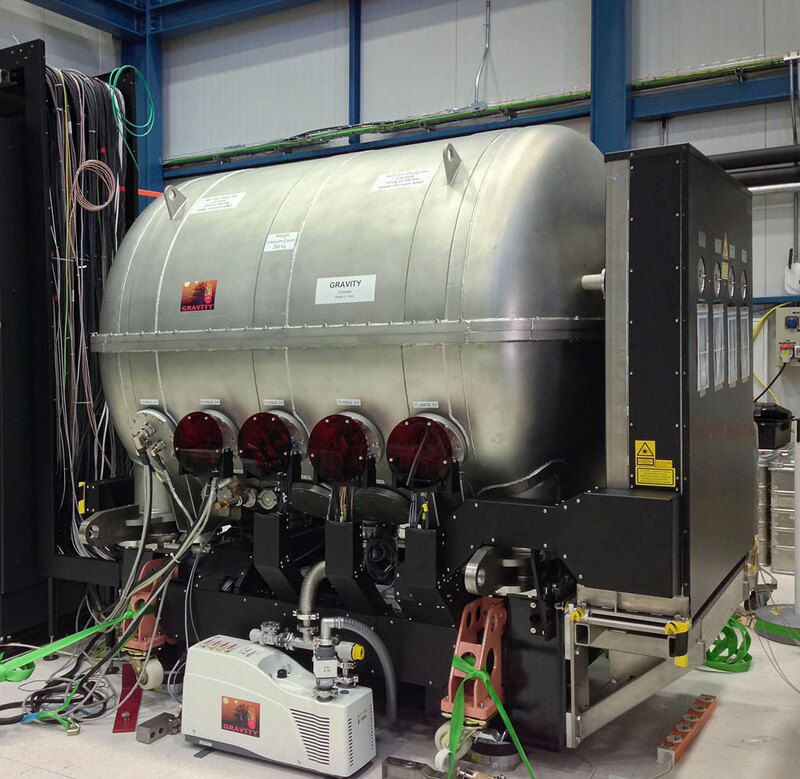 "Our analysis showed that HR8799e has an atmosphere containing far more carbon monoxide than methane – something not expected from equilibrium chemistry," explains team leader, Sylvestre Lacour. "We can best explain this surprising result with high vertical winds within the atmosphere preventing the carbon monoxide from reacting with hydrogen to form methane." An excess of carbon monoxide, when combined with clouds of iron and silicate dust, suggests that HR8799e is shrouded by an enormous and violent storm. This result builds on GRAVITY's already impressive string of discoveries – such as last year's observation of gas swirling at 30% of light speed just outside the event horizon of Sagittarius A*, the supermassive black hole at the centre of our galaxy. It also provides a new way of observing exoplanets and their atmospheres in greater detail than ever, paving the way to many more impressive discoveries.